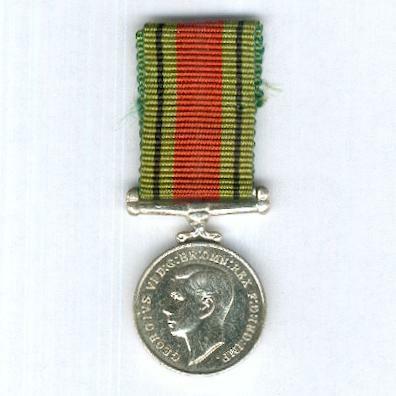 Miniature circular cupro-nickel medal with scroll and ribbon bar suspension; the face with the head of King George VI facing left, circumscribed ‘GEORGIVS VI D: G: BR: OMN: REX F: D: IND: IMP.’ (George VI by the Grace of God King of Great Britain, Defender of the Faith, Emperor of India); the reverse with a crowned oak sapling with lion supporters, wavy lines representing the sea below, dated ‘1939’ and ‘1945’ upper left and upper right respectively, inscribed below ‘THE DEFENCE / MEDAL’; diameter 18.64mm (0.73 inch); on original ribbon. 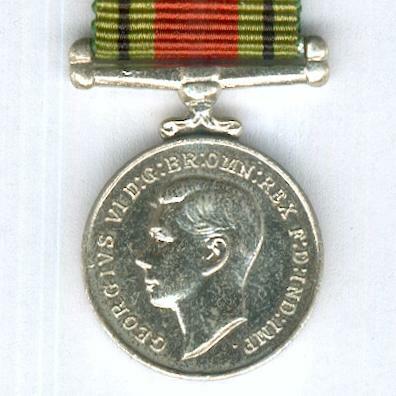 The Medal was instituted in May 1945 to recognise non-operational service from the outbreak of war (3 September 1939) to V.E. Day (8 May 1945) in Europe and to V.J. Day (2 September 1945) overseas. The qualifying service periods were 180 days in overseas areas subject to air attack or other close enemy threat, 360 days in other overseas areas and 1,080 days in the U.K.. For mine and bomb disposal personnel overseas, the qualification period was 90 days. 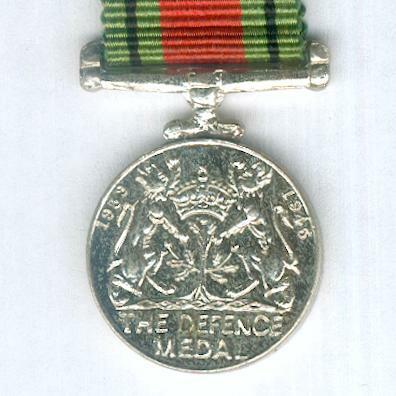 A number of special awards, such as those to the Malta Home Guard and to recipients of a Commendation for Brave Conduct or for Valuable Service in the Air, were also made.